Popcorn Fried Chicken Recipe - Today we are going to share indian style chicken recipe and this is fried chicken with popcorn. So all kinds of people will love it, this is so easy and beautiful. 1. Prepare the spice marinade by mixing all the spices together with the chicken. 2. Cover with cling film and leave to marinate for 1 hour. 3. Next, prepare the spice coating by mixing the bread crumbs, chili powder, turmeric, cumin, coriander, salt and pepper together. 4. Coat each chicken piece in egg wash, followed by the spice coating. 5. Heat the oil in a deep saucepan to 350°F/180°C. 6. Carefully place each chicken piece in the oil using a slotted spoon and fry for about 3-4 minutes, until golden brown and cooked through. 7. Serve with salad and favourite dips of your choice. 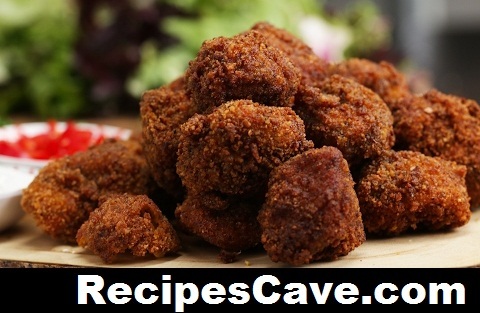 your Popcorn Fried Chicken Recipe is ready to taste.